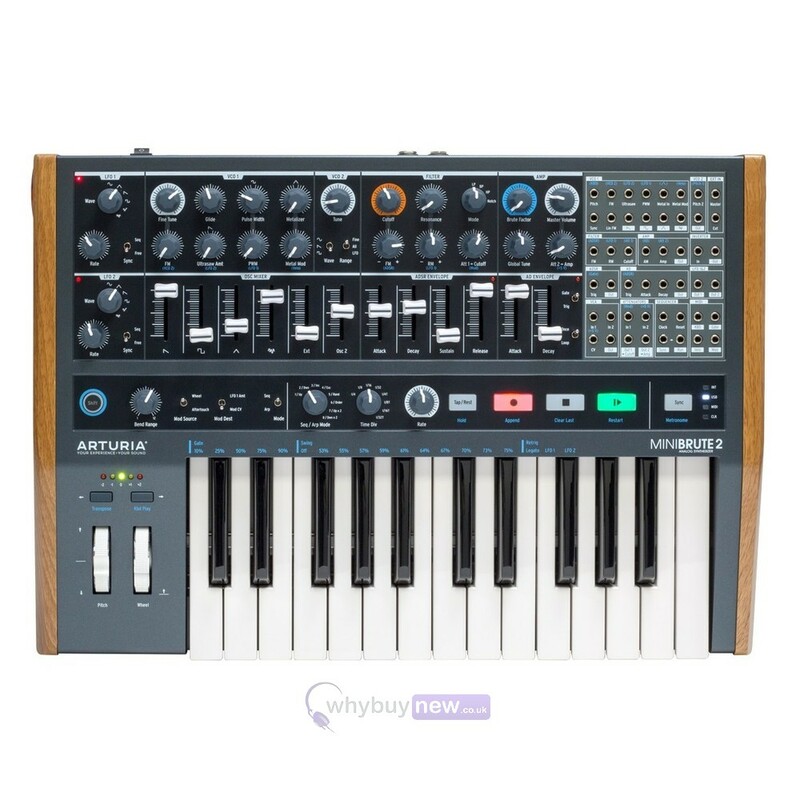 The Arturia MiniBrute 2 is a analog semi modular synthesiser that features 2 oscillators, waveform mixing, 2 LFO's and a whole host of other features. 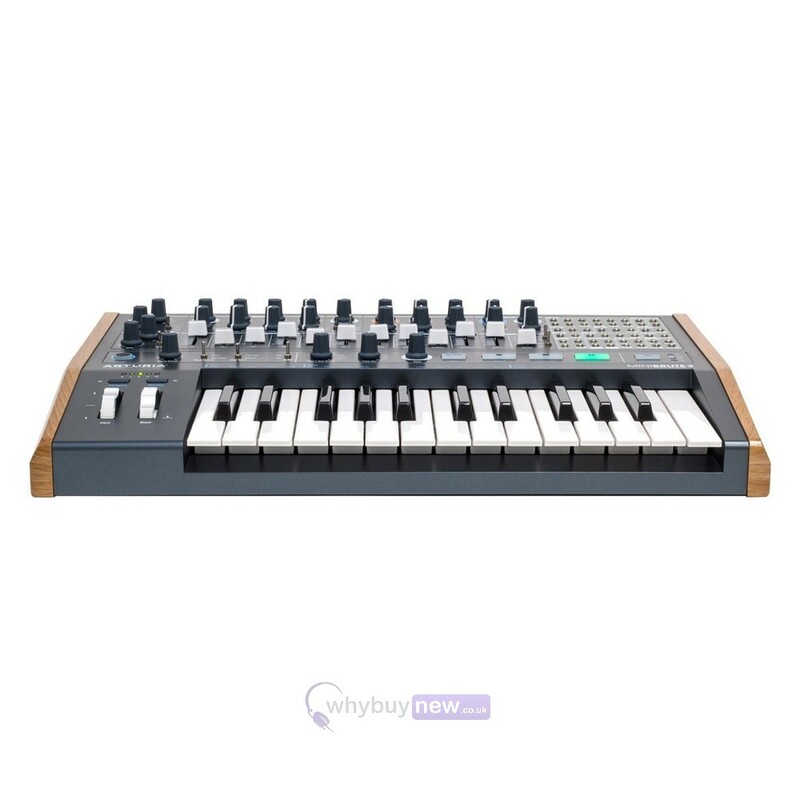 The Arturia MiniBrute 2 has a 25-key velocity sensitive keyboard section that enables you to play and perform in live situations as well as in the studio. 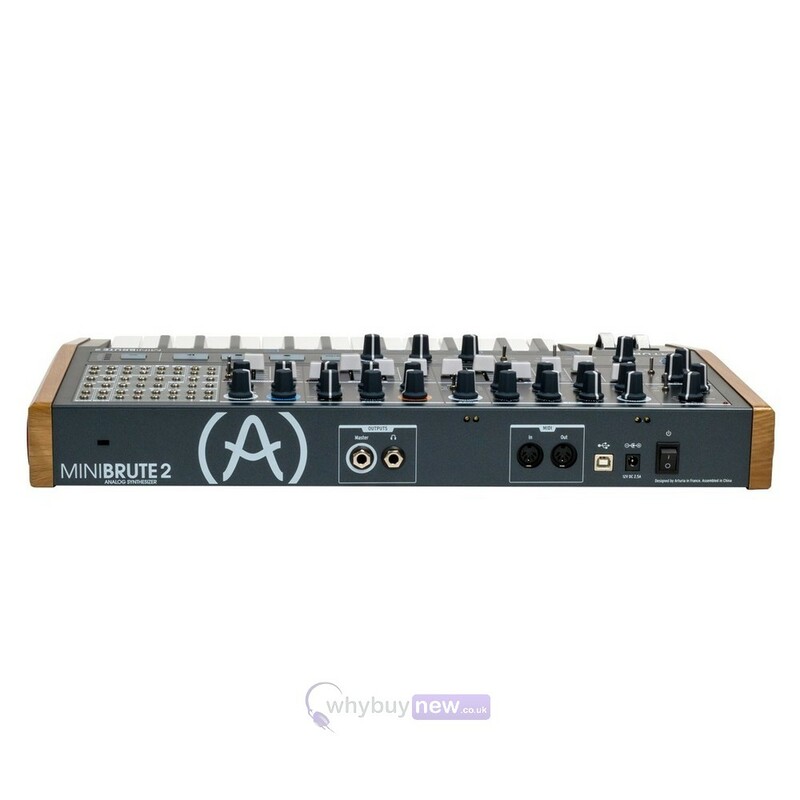 Weighing less than 5kg the Arturia MiniBrute 2 can easily be transported to and from your gigs or studio enabling you to use this instrument no matter where you are playing. Lets be honest, youre not here because you want the same old synth, are you? The MiniBrute 2 has nothing to hide. Take a look at its front panel, get yourself acquainted. 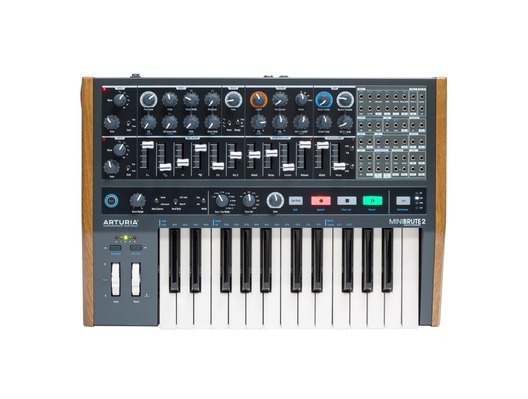 Youll notice the now-iconic Brute oscillators, the acidic Steiner-Parker filter, and the mayhem-inducing Brute Factor knob that has become the signature Arturia synth element for many fans. Looking a bit further, beyond the usual modulation sources and controls, youll notice some exciting, unexpected features: a second VCO; a second LFO; new VCO and Filter frequency modulation possibilities; modifier-related modulation destinations; a brand new, loopable AD envelope. Once tamed, this little beast will reveal the full range of its vocalizations, including raging leads and piercing sequences, as well as smooth pads and purring bass. Thanks to its massive CV/Gate patch bay, you will be able to reinvent and restructure your MiniBrute 2 at any time. The synth is semi-modular, even with no patch leads connected, and each of its features has already been cleverly, inspiringly routed. If you want to start dissecting the sound and experimenting, you will find direct, 100% safe access to the MiniBrute 2s genetic code on the right of its front panel. Designed by passionate synth enthusiasts to cater for the most intrepid, experimental musicians out there. The brainchild of Arturias daring product manager Seb Rochard, born on the foundations of synth guru Yves Usson's unique approach to synthesis, MiniBrute 2 is truly an instrument by musicians for musicians. Every aspect of the synth, from its layout to the carefully chosen components, reflects their painstaking obsession to bring you the most adaptable, joyous analog synth around. Once you take a look at MiniBrute 2s layout and features, everything becomes clear. Sawtooth, Pulse and Triangle waves with unique modifiers and direct FM control. Ultra Saw makes for huge sounds, Metalizer adds complex harmonics to the triangle wave. FM generates rich tones. Selectable waveform between sine, saw and square. Multiple tuning modes for fine, coarse or LFO operation. Allows for mixing the levels of the individual waveforms of the oscillator 1 and 2, the noise generator and the external inputs. The Brute Factor can add subtle drive effects to full blown intermodulation havoc. This modulator can generate AD, AHR or loopable envelopes. Its Attack and Decay times are CV-controllable, too. 48 CV inputs and outputs to control many elements of the synthesizer and sequencer. Some utility modules provide extended possibilities. Both LFO supply 6 waveforms and can run in sync to the Sequencer. Very fast rates can be obtained. Flexible sequencer or arpeggiator allows for instant melodic phrases. Syncs to MIDI clock over USB and MIDI In to play in sync with your favorite DAW. Mod Wheel & Aftertouch destinations and Pitch Bend amounts can all be set. 25 note velocity-sensitive keyboard with aftertouch. Octave buttons allow transposition of up to 5 octaves. 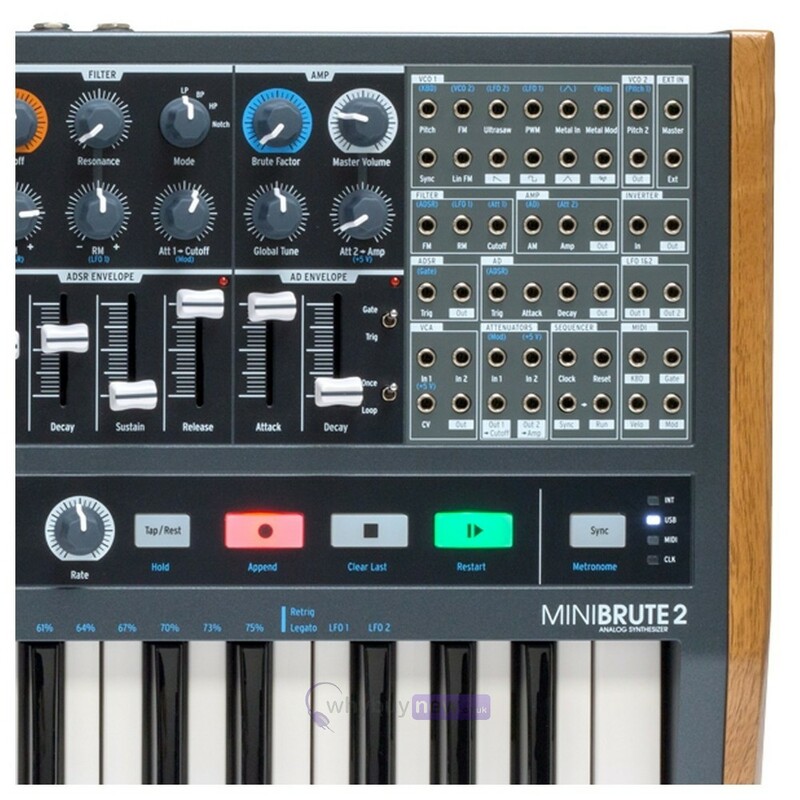 Maybe youll want to enjoy MiniBrute 2 as the musicians best friend it is; enjoying its devoted attention, safe in the privacy of your studio, and at the center of your creative setup. Maybe youll want to share its awesome tricks and sonic prowess on stage, with an audience. Whatever you have planned for this incredible synthesizer, it wont let you down. One things for certain: once you get your hands on this beast, youll never want to take them off. A Cook Book jam-packed full of superb sonic recipes for you to try out, put together by some of the most illustrious synth-chefs around. 2 Analog VCOs: VCO1 : Saw + UltraSaw, Square +Pulse width, Triangle + Metalizer. (Waveform mixing) / VCO2 : Sine, Saw, Square waveforms (three tuning ranges).